The Raka is a well-balanced bike that climbs with notable ease. This bike will not hold you back despite its plush 120mm suspension that comfortably takes small and large bumps and big hits, and the fork is noticeably smoother than the traditional 100mm forks, especially on small bumps. The bike is equipped with Fox Float 29 Factory FIT on the front, with a remote handlebar-mounted 3-position lock out. The rear shock is a Fox Float Factory, also with three positions, with the switch located on the shock (we would have preferred a bar-mounted lockout). The intricacy of the M-Link 4 bar linkage rear suspension benefits the rider in terms of excellent tracking, stiffness and responsiveness, relative to the bike’s heavier weight, though this intricate design also means lots of places to catch mud, which can be a considerable barrier for those that like to hit the slop. Of course the softer suspension also means more bob when climbing or accelerating when not locked out. For an alloy frame, the Fuji Rakan 1.1 is a robust bike with excellent torsional rigidity, and very nice ride quality and stiffness. However, it feels somewhat overbuilt for an XC/Trail bike, and definitely a bit too heavy—this frame could certainly handle far more aggressive riding. We felt no flex in the Rakan’s rear triangle of this custom-butted frame, and combined with the highly effective M-Link this creates impressive speed relative to its weight, although it simply can’t compare with the overall responsiveness of 3-pound-lighter rigs with carbon frames. We were also impressed with the Oval Concepts M610 hollow forged crank which is impressively stiff for added efficiency. The Fuji Rakan 1.1 is an exceptional climbing machine overall, with suspension that doesn’t budge when locked, and barely moves when unlocked, especially in the rear. We really noted its performance as its a surprisingly comfortable ride on grinding rocky climbs, thanks to smart geometry and frame construction which provides an amazingly comfortable and balanced rider position. 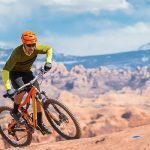 However, while the frame and crank are impressively rigid, the softer suspension and heavy weight is definitely noticeable, especially on smoother trails where it’s just not necessary, and on longer, sustained climbs. This tradeoff of comfort versus energy is a tough one to call, and will definitely be a personal choice. As our favorite descender in the group, the Fuji Rakan 1.1 rolls beautifully over aggressive vertical terrain with a nicely balanced rider position, a geometry that inspires confidence, and just enough suspension for some added fun along the way; it also handles high-speed corners as you would expect from a bike at a higher price point and lighter weight. The DT Swiss wheels, paired with the outstanding Shimano XT brakes combine with the M-Link suspension to inspire plunging into rock gardens and baby heads much more aggressively than with the others in this group. The Schwalbe Rocket Ron tires have excellent grab in the hard corners, both dry and wet, and further enhance the downhill thrill. A smart combination of Shimano XT brakes and SRAM’s X1 shifting is spec’d on the Fuji Rakan 1.1. The Shimano XT hydraulic brakes perform as well if not better than the XTR brakes we tested at the same time, with single finger braking with excellent modulation and no discernable brake fade on pounding descents. We’re sold on the 1x system in general, and the SRAM X1 11 speed shifter and cassette combine for simple, reliable shifting. The range of gears (10-42T) proved plenty on sustained, steep climbs, even with the bike’s extra weight, but we could have used one higher gear on the flying downhills. The internal routed cables keep a clean looking bike, through the points of entry into the frame could be improved as ours continued to pop out (purely cosmetic, in no way impacting function). When a wheelset says DT Swiss on it, you can be confident it’ll be strong and exceptionally well built, with hubs that have been proven year after year. These X1700 Spline Two wheels were certainly no exception, demonstrating no flex we could discern, rolling fast and smooth, and staying true over some very heavy riding. The 15mm thru-axles front and back increased the overall ride quality of the Fuji by stiffening the wheel/frame interfaces, although the axles integration on the rear made for problematic trailside tire changes, with a less-than-perfect fit. The Fuji Rakan 1.1 is a strong value for the money if you love high-speed descents and hit trails that are considerably more technical than what’s typical in XC riding. It’s clearly the best all-arounder in the group, which adds a good bit of value. However, if you’re looking for raw speed and/or a bike for racing, it’s not the best option, and cheaper bikes (under $4000) are certainly available that would perform better for that type of riding. Fuji would be smart to spec a lighter wheelset for the same price, which would make this an outstanding value, although even with its heft, it rides like some bikes that cost substantially more—and you really won’t notice the weight much unless you do a lot of climbing, and of course when you heave it onto the roof rack of your car!